Cardiac arrest is a leading cause of death, and CPR — if performed immediately and properly — can drastically increase survival rates. In Detroit, however, only three out of 10 people have this lifesaving measure performed on them before EMS arrives. 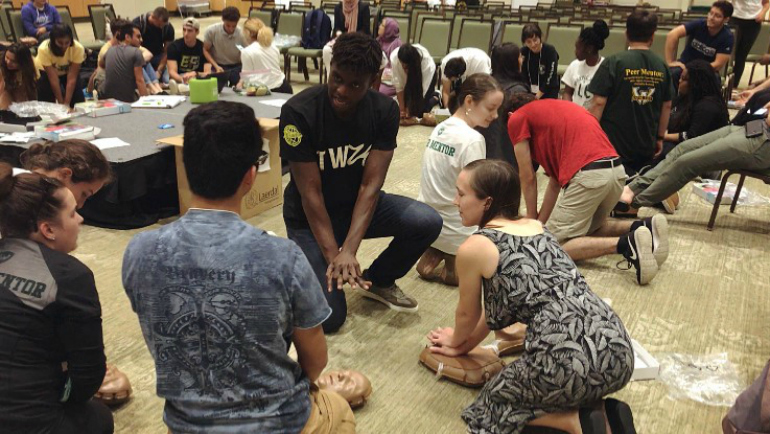 To help improve outcomes, Wayne State students have partnered with the American Heart Association to host the inaugural University Hands-Only CPR Challenge from Sept. 15-21, which will help train the community to react with the proper steps to save a life using simple, hands-only CPR. The challenge will see which Michigan university can teach the most people CPR. All Wayne State students, staff and faculty, along with local community members, are invited to participate. During the challenge, trainers will host walk-in workshops across campus to teach participants how to perform the Hands-Only CPR method. Participants must complete an online survey after their training in order for the university to earn points, which will help determine the challenge winner. By using the CORQ app, participants will be entered into a raffle for a chance to win a $25 gift card to the campus bookstore or a winter semester parking pass. To learn more about the Hands-Only CPR Challenge, contact HOCPRchallenge@wayne.edu. Participants are encouraged to post photos related to the challenge on social media tagging @universityHOCPR using the hashtag #Warriors4heart.